NHOA is a nonprofit organization which relies on donations, grants, and special events for funding. All advocacy services are provided free of charge to those who need them. We use Network for Good for safe and secure online gifts. 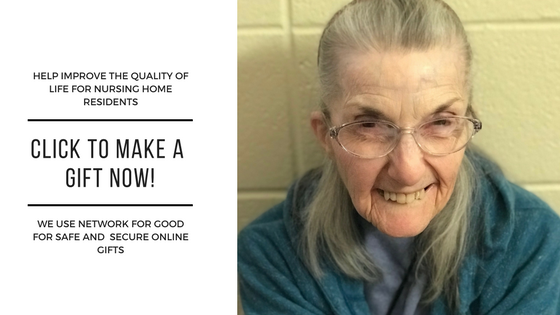 Give the gift of time to mothers and grandmothers in long-term care facilities. See how YOUR gift can make a difference! Read Priscilla’s story here. Support NHOA by shopping at AmazonSmile. When you shop at AmazonSmile, the Nursing Home Ombudsman Agency receives a percentage of the amount you spend. Just be sure to click the button below to start shopping on Amazon. The Nursing Home Ombudsman Agency is enrolled in Kroger’s Community Rewards Program. We invite and encourage you to register your Kroger Plus card online at www.kroger.com/communityrewards, and please spread the word! Register online at www.kroger.com/communityrewards and follow the prompts. You will need to enter your card number so keep the card handy. Have your Kroger Plus card handy and register your card with your organization after you sign up. If you do not yet have a Kroger Plus card they are available at the customer service desk at any Kroger.